To have or NOT to have your child a BIRTHDAY PARTY? That is the dilemma I am facing this year. I have two wonderful children and they have been having a party every year since birth! I love giving them parties and I am sure they enjoy it, but it gets tiring and it gets expensive. 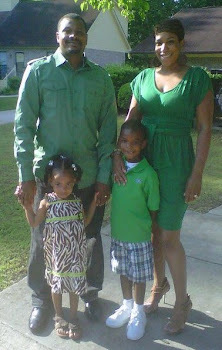 My son will be 6 this year and my daughter will be 4. My and husband and I have agreed from now on, we will do parties every other year. And this year will be the year of NO parties. What we are doing is allowing our children to pick 4-5 friends and we will take them out and spend the day. My son is actually a 4th of July baby. This year we are letting him choose his friends and his activity for this coming Saturday. He wants to go see Cars 2, lunch and bowling! I am definitely doing lunch and the movies but bowling might be ruled out. Once I add up all the kids for movies and lunch, that’s enough. If I add bowling, I feel I might as well have had a party! We are doing this to save money. But I don’t know, I will see how the day flows. What about you? Do you give your children a party every year? I think if you want to and have the means to do it, by all means – have a party. If you want to take a break from the many kids running around and do something just as impactful for their special day – do that as an option. Whether you give your kids a party or not, they just want to have a blast for their birthday. I do have a question. For parities where you let him invite 4 or 5 friends, should you choose the friends or let him choose? I let him choose his party crew. He knows best who he feels he will have a blast with. I have started on a journey to redefine my body. I want a new shape and I am committed to changing it. I believe if you want a new look, maybe you should change too. I am not doing it with surgery or pills (but I do take vitamins) but I am doing the workout DVD INSANITY! I am 34 and I am already in good shape. I stayed active as a child/teenager and did cheerleading and track all of my adolescent years. Even as an adult I continue to work out and attempt to eat a balanced diet. Although sometimes French fries, pizza & chicken wings get the best of me. You see I am not a sweets person (which is another reason I believe my weight has stayed down over the years). I hardly ever eat cake. I don’t like pies and really hardly ever desire a donut, cookie or candy. I just have no desire for that. But like I just said - if you put some fries or pizza (good pizza not the franchise stuff!) in front of me…………. I might bend! I am healthy. I am currently a size 8 and can fit into some (limited some) 6’s. At my last physical, all of my blood work came back as HEALTHY & great numbers! But I want a better body. It’s not about size with me because I am happy with my actual size (how I look in my clothes) but not excited about my actual weight and just the actual change in the body (kids & age). I am thankful for what my past exercise regimen has done for me but what I realize was – I was maintaining what I have (weight) and not actually trying to redefine my body. I currently weight (here it comes!!!) 150. 10 pounds of that is after baby weight! 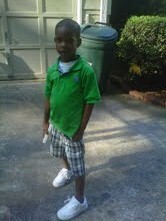 My baby is 3 ½ and I have never been 150 in my life. Before my son, I was 144 (the biggest ever at the time), but some of that weight was newlywed weight. After I had him, I lost all 70 pounds and then some. I got back down to 135. Looking and feeling great! But here comes baby number 2. I gain another 70 pounds but haven’t been able to knock off this last 10 pounds. It’s funny because I have been concentrating more on the 10 pounds over the last 6 months and it is remaining steady. I will eat right, work out and lose 2-4 pounds and then here come Friday, Saturday & Sunday eating. I will gain it all back over the weekend. I want to lose 10 pounds and TONE my thighs, arms and get my abs TIZ-IGHT! At one point I wanted a tummy tuck, but I realized my stomach is not that bad. And if I just dedicated myself to really working out, I could fix it naturally (I do understand everyone can’t do that). I don’t just want to lose 10 pounds, but I want my body DEFINED! And I am excited about INSANITY because if I am faithful to the process, I know in 58 days, I will have a better body! I am going to blog about my journey and hopefully you will comment about yours. And if not, just enjoy the story. I am not going to post before and after until AFTER! I will be Thirty-FINE in a few months and my goal has always been to grow older gracefully. It’s time to have the body I want and dedicate myself to doing. No one is going to do it for me but me! I am tired of wearing girdles, body magic’s, corset’s, etc.! I just want to put on my bra and shirt and GO! I never wore support before my kids! I just held it in! LOL!!! But now, these support garments have become part of my freaking wardrobe! NO MORE! NO MORE! BETTER BODY COME FORTH! So today is day 2 out of a 60 day program. I started last night after watching the BET Awards (which were a little disappointing, honestly). And I got up again, something I have NEVER done, at 6am to work out before going to work. I also have a new job at a college, so this is going to be interesting. Insanity makes you sweat like no other workout, so it looks like I will have to wet/rinse my hair after every workout. Thank GOD I am natural (no relaxer), so I can wet and go! Plus, its summer so I don’t do a lot of hair straightening in the summer anyway due to Georgia humidity! So I will be rocking a fro for 60 days! WIFE NIGHT: Sip & Swallow! What is your Love Language? 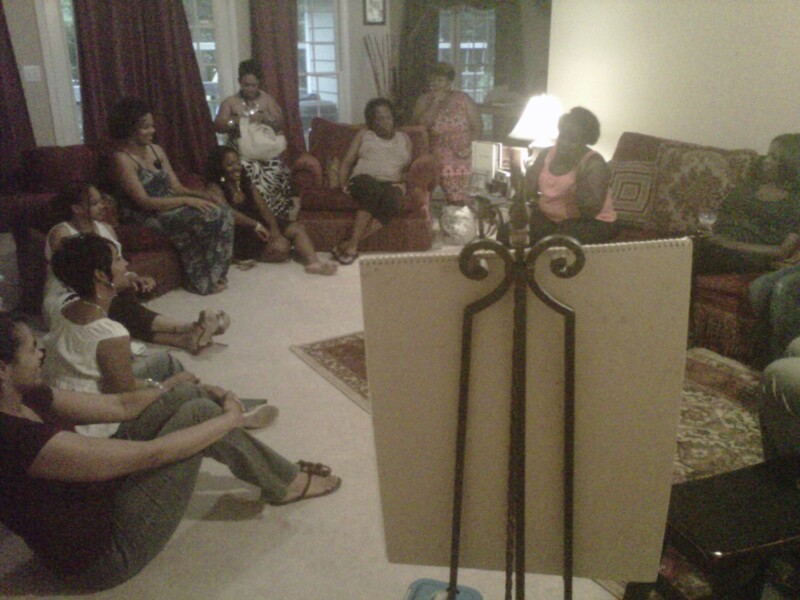 Saturday, June 11th we had our first WIFE NIGHT Support Group Gathering. We called the night Sip & Swallow and we had a ball! We (Teresa, Angela & I) taught about the 5 Love Languages. It's based on the book by Dr. Gary Chapman. When the night began, I was able to explain where the idea of WIFE came from and what my goals are for the organization. We then proceeded to all share a little bit about ourselves and a Hot & Spicy tip that makes our hubby smile. OMG! You had to be there for some of the things that were said! Greats tips! It should have been called tips & sips! I have more pictures, but I need to get them downloaded from my friend! After all the tips we took a wine break and jumped right into the topic of the night, the 5 Love Languages. The WIVES took a quiz, which gave them a preview of what their love language would be and how it can effect their communication within their marriage. What I loved about this night was the dialogue. The women that came shared, laughed, taught and just had a great time! Below are a few comments I got on the facebook event page as well as a summary of the 5 Love Languages! "Had a great time... Ill be sure to bring a guest next time"
"Bernetta you truly have an awesome creative gift. Continue to yield to the Lord and keep up the good work." "I Really enjoyed my self at the very first W.I.F.E Gathering. 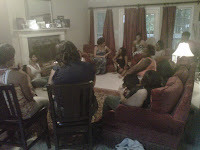 I enjoyed hearing everyones hot and spicy tips, I can not wait for the next one!!" "I had a ball!!! Thank you sooo much for inviting me!!!" "I had a great time and took away a lot of tips! I look forward to your next event"
Words of Affirmation - Actions don’t always speak louder than words. If this is your love language, unsolicited compliments mean the world to you. Hearing the words, “I love you,” are important—hearing the reasons behind that love sends your spirits skyward. Insults can leave you shattered and are not easily forgotten. Quality Time - In the vernacular of Quality Time, nothing says, “I love you,” like full, undivided attention. Being there for this type of person is critical, but really being there—with the TV off, fork and knife down, and all chores and tasks on standby—makes your significant other feel truly special and loved. Distractions, postponed dates, or the failure to listen can be especially hurtful. Receiving Gifts - Don’t mistake this love language for materialism; the receiver of gifts thrives on the love, thoughtfulness, and effort behind the gift. If you speak this language, the perfect gift or gesture shows that you are known, you are cared for, and you are prized above whatever was sacrificed to bring the gift to you. A missed birthday, anniversary, or a hasty, thoughtless gift would be disastrous—so would the absence of everyday gestures. Acts of Service - Can vacuuming the floors really be an expression of love? Absolutely! Anything you do to ease the burden of responsibilities weighing on an “Acts of Service” person will speak volumes. The words he or she most want to hear: “Let me do that for you.” Laziness, broken commitments, and making more work for them tell speakers of this language their feelings don’t matter. Physical Touch - This language isn’t all about the bedroom. A person whose primary language is Physical Touch is, not surprisingly, very touchy. Hugs, pats on the back, holding hands, and thoughtful touches on the arm, shoulder, or face—they can all be ways to show excitement, concern, care, and love. Physical presence and accessibility are crucial, while neglect or abuse can be unforgivable and destructive.